What good is all that traffic, if it doesn’t generate sales? Most businesses leave one important factor out when it comes to traffic…increasing online conversion. There are businesses out there that make hundreds of thousands of pounds, yet have some of the smallest traffic numbers. Let’s go over some ways to make the most out of the traffic you currently receive and increase conversion. As humans, we are hard-wired to follow instructions. When we are directed to do something, we take notice. Your visitors need directing if you want to convert them. If you’re trying to collect leads, for example, make sure the “Sign up” form stands out. A common problem is that these forms tend to blend into the page. If this form doesn’t jump out at your visitors, you’re not going to get their details. To get someone to click a link, don’t just simply link to a page and hope they will click on it. Direct them…“Click on the following link to learn more about service/product”. How often do you read every single line of text on a website? A typical user will scan a page, scrolling up and down before settling on a certain area and reading the parts that stick out to them the most. 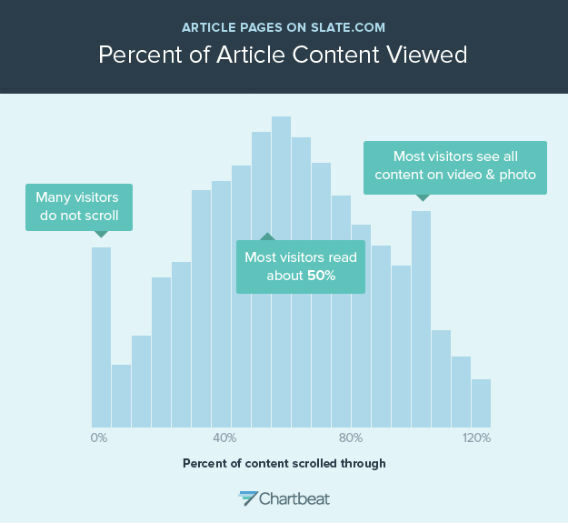 As this research from Slate shows, readers scroll past a whole lot of your content. Make sure that any key information that you want users to read is under a large heading. It also helps that the headline is snappy, to the point and makes the customer aware of what to expect in the lines of text beneath. Sometimes, if you really drill down your headlines, you can give answers to potential future questions. “Our 100% No-Questions Asked Money-Back guarantee” is a great example. Now that you’ve got them reading, don’t forget the first tip. Clear calls to action. Attention has become a precious thing. New emails are coming in that need a response, the phone is ringing… oh wait, is that someone at the office door? This applies to everything. Give people the information they need and want and leave it at that. Don’t waste their time. Short form content has fast become the norm and it’s going to stay that way. “No copywriter drafts finished copy at the first sitting. The secret to great writing is the way you edit your original draft, regardless of whether your text is two short paragraphs or 2000 words in length. The process of reviewing and revising your copy can transform it from well-written, logical text into a highly compelling proposition.” – Copywriting. Successful writing for design, advertising and marketing, Mark Shaw. We all do our best to help consumers make a buying decision. We try to make sure they know we can ship their products in 24 hours or that we offer a no-questions asked money-back guarantee. Yet sometimes, this isn’t as clear to your consumers as you may think. Communication is vital, yet online, we treat this as a one way conversation. We speak out about how we do this or how we do that but sometimes consumers want to converse with a human being to give them that extra bit of confirmation and clarity. Make sure that a means of communication is always available on your site. A contact page is always important to have in the header of your site, but it’s what’s on that contact page that makes all the difference. An email form and postal address don’t really cut it these days. Phone numbers (with available times) are a must, but why not go that step further and offer an instant method of communication? 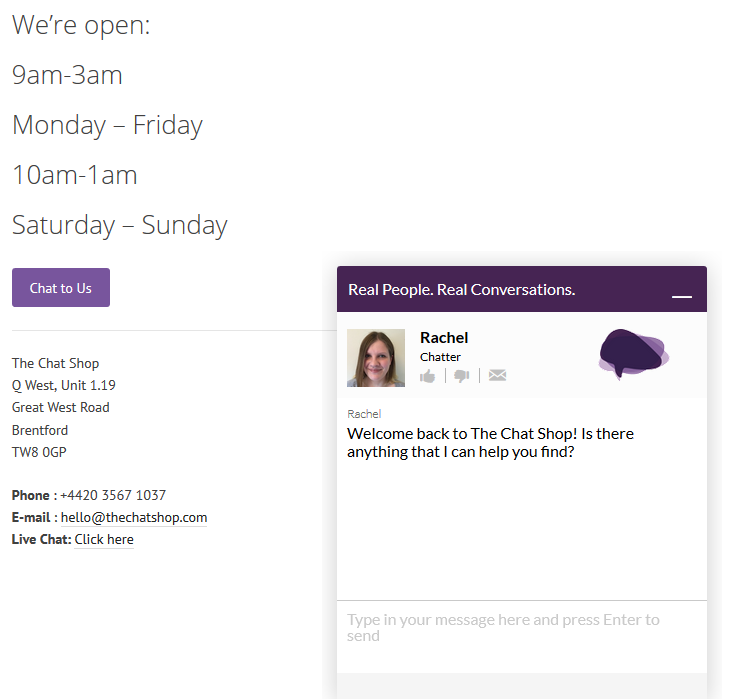 Live chat is quickly becoming one of the most preferred communication tools and a great addition to any site.